Fork Lift can be maneuvered. 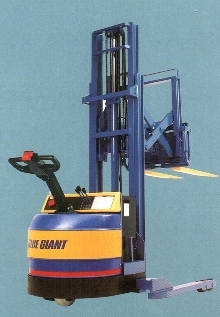 BGNR Series Walkie Reach Truck is suited for backrooms or other congested areas. It has 24 in. heavy-duty reach mechanism with internal hosing. Forks have 2 degree forward and 6 degree back tilt for handling pallets, even if pallets are damaged or stored two or three stringers high. Reach action is cushioned for steady and controlled extension and retraction of loads. 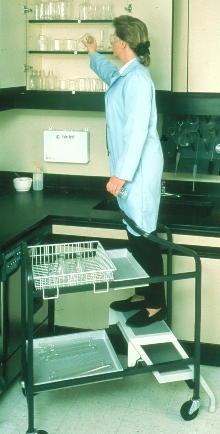 Cart combines cart and ladder in one unit.